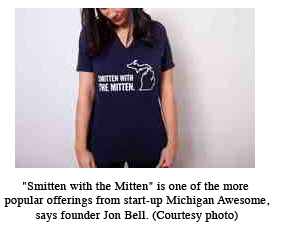 Jon Bell got so tired of hearing friends slam Michigan as a place with no future, he started a company that promotes the state everywhere people go. Since the day he opened Michigan Awesome two years ago, the Grand Rapids native has sold 3,500 T-shirts, each with a pithy slogan that promotes one corner or aspect of Michigan. Bell used to smile when his brother would tell people he was from "the epicenter of progressive culture: Grand Rapids, Michigan." So he decided to print that slogan on his first shirt. Other favorites include: "Bi-Peninsular and Proud"; "Smitten with the Mitten"; "Saginawesome"; "Lake Effective"; "(G-RAP)"; and "Tahquamenon Phenomenon." Bell said the business model is simple: He comes up with an idea for a saying, tries it out on a few friends and designs the shirt on his computer. He then gives the design file to a friend who owns CitizenShirt, a screen-printing company in Grand Rapids. The friend makes a few samples using part of the inventory of T-shirts Bell bought wholesale. Next, Bell finds some friends to model the shirts and that photograph goes on the website. He markets the shirts on Facebook and Twitter, and has placed ads with Facebook, Google, Groupon and LivingSocial. Each T-shirt is made to order and sells for $20. Bell packs the shirt with a packing slip, adds a personal note and mails it. "It's such a simple process, I'm actually surprised more people aren't doing things like this," said Bell, who started the business with a small loan. "I get a big kick out of it." “Michigan Awesome is not about making money," he emphasized. "That's not the point. The point is to spread good will and have some fun with it at the same time." Retail shops and boutiques are next on his marketing plan. He just sent out 170 wholesale pricelists to Michigan retailers hoping they’ll carry some shirts. "We do a pretty vibrant online business, and I would really, really love to grow the retail side of it," he said. “My hope is that -- sooner rather than later, if I keep working at it -- there can be a bunch of places around the state, not just here in Grand Rapids, carrying Michigan Awesome products." "I want our state to do well, and I want people to have some pride in it," he said.